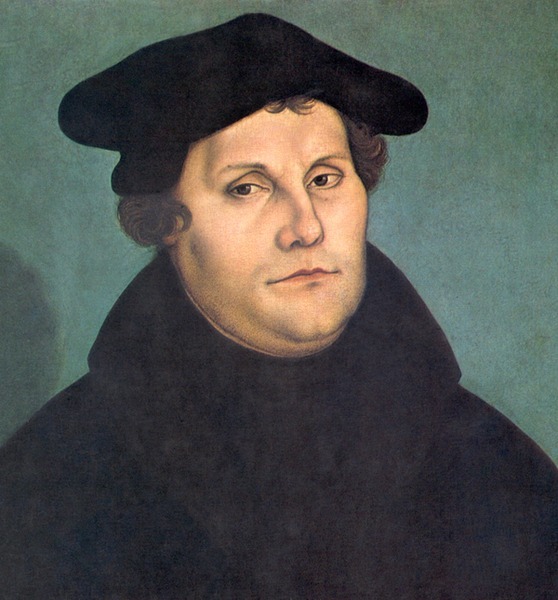 The title ‘Protestant’ comes from Martin Luther and his followers (which included several princes and rulers) protesting what they found to be disagreeable in the Catholic Church in the 1500s. Basically, the Church was, in spite of several schisms and heresies pulling it in many directions, the most powerful political and social force in Western Europe at the time. Many were upset because the Catholic Church was hording wealth, determined which princes were entitled to rule based on whether they had favor, and that the Church would sell ‘forgiveness’ in the form of indulgences (if one had money, it was considered balance for sins to give that money to the church). Interestingly, Buddhist monasteries got into these very problems in China when Buddhism came in and became the largest religion in the area. I like this point very much, as many consider Christianity and Buddhism to be miles apart but at times they have behaved very much the same in history, half the world away. 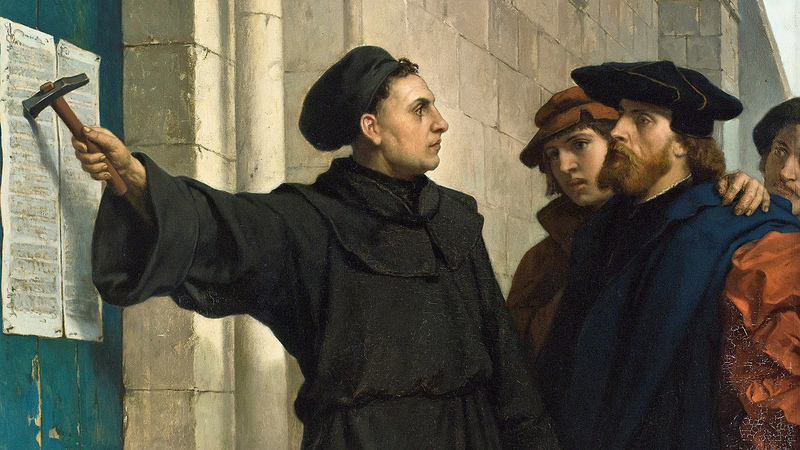 Originally, Martin Luther (who famously tacked 95 theses or arguments to the cathedral door in Württemberg) and other reformers were simply trying for reform, to revolutionize the Catholic Church. They were not trying to start a schism, a break into separate Christian institutions, but they were accused of this by loyalists to the Church. Eventually, Protestants broke from the Catholic Church when it became clear that the Catholic hierarchy was refusing to budge. Thus, many separate Protestant Christianities were born. Some estimate the number of denominations to be over 30,000 today, but other scholars put a more conservative guess at about 1,000 (keep in mind, often a sect in a new place would become a new denomination within a single family denomination such as Presbyterianism, such as Presbyterian factions in Africa today). The 5 Solas are creeds, claims of faith and belief that came to separate Protestant thought from the Catholic Church and hierarchy early on. The five are: Solus Christus (Christ Alone), Sola Scriptura (Scripture Alone), Sola Fide (Faith Alone), Sola Gratia (Grace Alone), and Soli Deo Gloria (Glory to God Alone). We will treat each of these in order. The Catholic Church taught that the Pope is the representative of Christ on Earth, and so the Pope has the duty and right to interpret the will and word (scriptures) of God to the flock of Christians. By the 1500s, the lineage of Popes had made many political decisions that had angered many rulers and populations across Europe, particularly in Germany, the land of Luther. Protestants came to believe that because Jesus is present in each individual, there was no need to have a Pope or priests to serve as a necessary conduit for God and Jesus to the people. Thus, rulers who followed Luther and other reformers now could ignore what the Pope said and not fear angering God or Jesus in the process. Hegel, the philosopher and major patriarch of historical explanations, believed that Christianity had evolved to become the final form of religion in German Lutheranism because every male head of a household was his own family priest. One of the major advances Protestantism made for Christianity was vernacular translations of the Bible (translations from Latin and Greek into French, German, English, and other European languages). Before this, the Catholic Church held a monopoly on Biblical interpretation, as one had to learn Latin through Church affiliated schools and the worship service (Catholic Mass) was given in Latin. As Protestants rejected the hierarchy of the Church, they had to take authority from somewhere, so there was a turn back to scripture as ‘the Word of God’, the sole authority above human beings. In America today (which is a Protestant dominated nation) many Protestants today believe in this arrangement, which is why there is so much controversy today over the ‘literal’ word of the Bible (in translation, of course…in fact, a Texas state senator once famously declared in opposition to bilingual Spanish-English education, “If English was good enough for Jesus, its good enough for everybody”). When the Bible was translated by many regional reformers, now Protestant sects could claim the same authority as the Pope and the Bishops simply by reading the Bible for themselves. Because, of course, the Catholic Church came into being at the Council of Nicaea along with the Bible, gathering the arrangement of books and putting them in order, the Catholic Church had placed great emphasis on the Bible, but in fact Catholicism to this day places more emphasis on the unity of the Catholic Church, the communion of believers, than on the ‘literal’ word of scripture. The Protestants flipped this, putting the emphasis on text rather than institution. Of course, Catholics and Protestants share the same concerns over adhering to both text and authorities. Another famous split between Catholics and Protestants is that between salvation by works and salvation by faith (though, like the scripture/authority issue, both groups honor both sources of salvation in various ways). Catholicism places emphasis on works, on doing good deeds and pushing oneself to better oneself through doing good (consider the orders of nuns who do work with the poor, like Mother Theresa). While Protestants of course like good works, Protestants came to see faith as the sole key to one’s salvation in Jesus. Only faith in the end saves someone according to Protestant theology. Good works are a by-product of faith, not a necessary precursor. Consider the ‘born again’ movement in America and the emphasis that Protestant evangelicals place on faith in Jesus as God (alongside belief in the scripture, discussed above). Remember that Luther became very upset with the Catholic Church granting rich patrons indulgences, which were a type of ‘good work’, done for merit. Rejecting this radically, Protestants taught that there is no salvation in the institution (such as the Church) but only in believing in Jesus directly. Calvinists are the most extreme in this doctrine, preaching that all human works are for evil and prideful motives and that only faith in Jesus alone can affirm one’s rightful place in the community of the elect. This one is very similar to the preceding ‘Faith Alone’. The Catholic Church teaches that one can earn one’s place in heaven by doing good works. According to the Protestant reformers, it is evil and prideful to believe that one has earned one’s salvation for oneself. Jesus saves alone by sacrificing his life, and thus it is only by God’s grace (Grace Alone) that one has a place in heaven. Thus, while it is of course not true that Protestants frown on good works, and it is true that Protestants value faith above good works, one can work hard and have faith but it is God who saves and not the work or faith of the individual. Remember, again, that Protestant reformers were angry with a Catholic Church that gave salvation to people as it wished, sometimes for money and other times for making the right political decisions. During the Crusades, the Popes declared that going to war would earn one a place in heaven because the Church has been given authority by God to make such a promise. Protestants rejected this, arguing that no set of powerful human beings could make such a promise, as it is by God’s power and not human earning that salvation is obtained. Protestants rejected the Catholic Church’s claim to being God’s representative and middle man on Earth, believing that it is only right to honor the authority of God/Jesus (and of course, having given the scripture ‘word of God’ status, the scripture is now above the authority of the Church to have gathered such a book). Many controversies remained in spite of these major shared trends in Protestant thought, and these controversies split Protestants into many factions. One issue was the value and purpose of the ritual of communion (blessing bread and wine as ‘Body of Christ’). In the middle ages, this was given the greatest emphasis by the Catholic Church. In fact, because the mass was given in Latin and most folk did not understand a word of Latin, many Christians would wait until the communion ceremony, and then rush into the church or cathedral to get a glimpse of the bread and cup when they were held aloft by the priest because they believed that the glimpse of Jesus’ own body and blood was more important than attending the rest of the ceremony. Often, communion wafers (the bread Catholics use for ceremony) were stolen and used by Christians as good luck charms, wards against evil, and cures for diseases. Some Protestant groups, notably the Lutherans who as a Protestant sect stayed close to Catholic doctrines compared to others, kept the ceremony and belief in transubstantiation (the change of the substance of bread and wine into identity with Jesus). Other Protestant groups kept the ceremony but believed it to be only a symbol as Jesus is present in everyone whether one receives communion in the ceremony or not. Yet other groups completely rejected the ceremony as a Catholic control device designed to keep believers subjected to institutional authority.